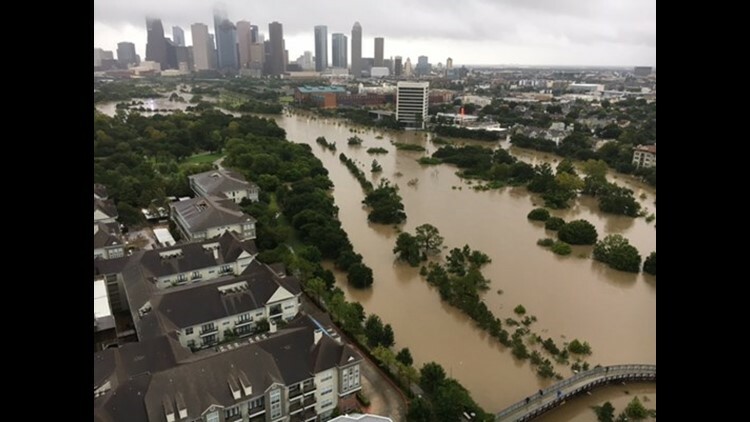 Residents are still attempting to cope with the impacts of Hurricane Harvey, which has caused "unprecedented" flooding in the Houston area. 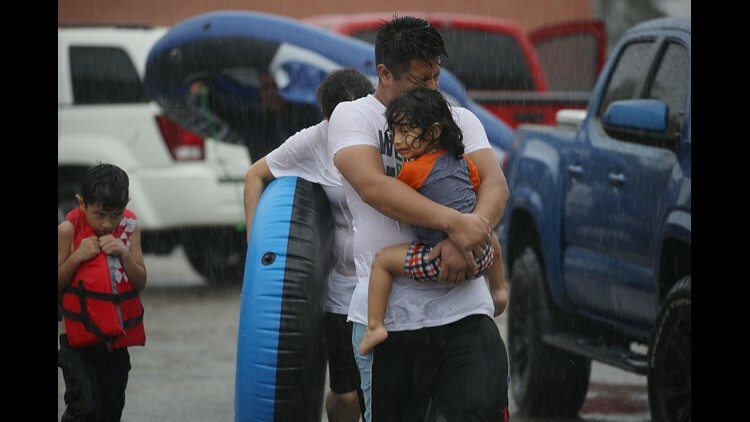 Many homes and buildings have been severely damaged or are completely under water, and rescue efforts are still under way. 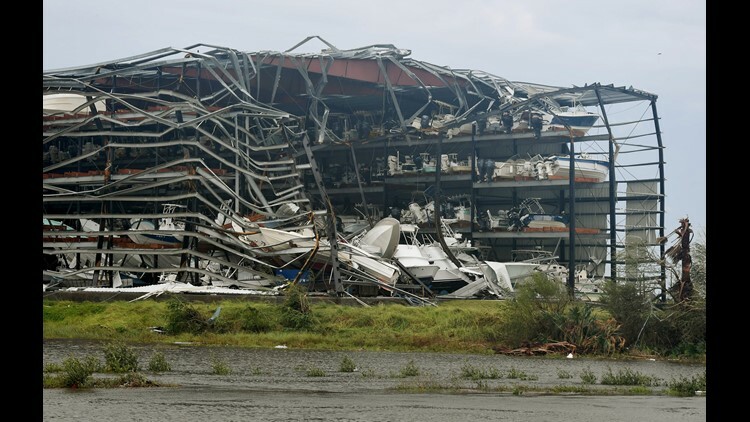 Damaged boats in a multi-level storage facility are seen following passage of Hurricane Harvey at Rockport, Texas on August 26, 2017. 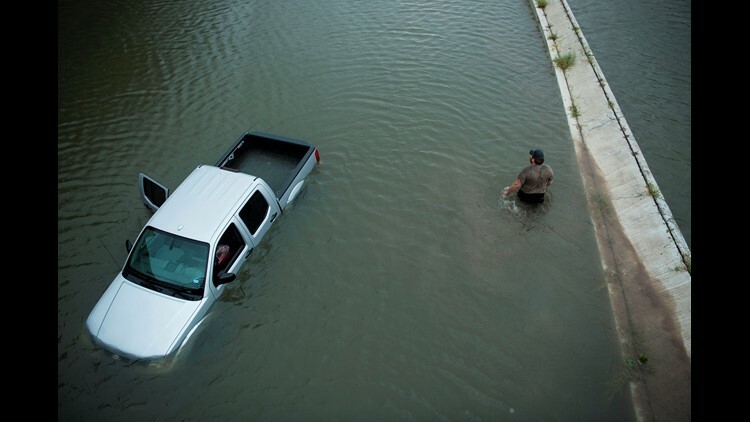 A truck driver walks past an abandoned truck while checking the depth of an underpass during the aftermath of Hurricane Harvey August 28, 2017 in Houston, Texas. 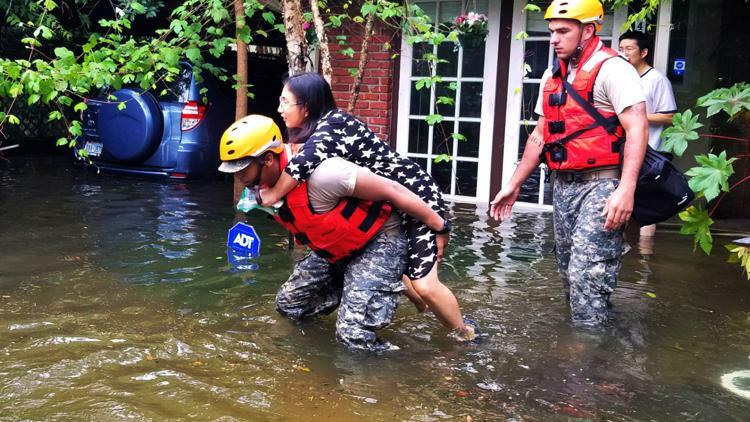 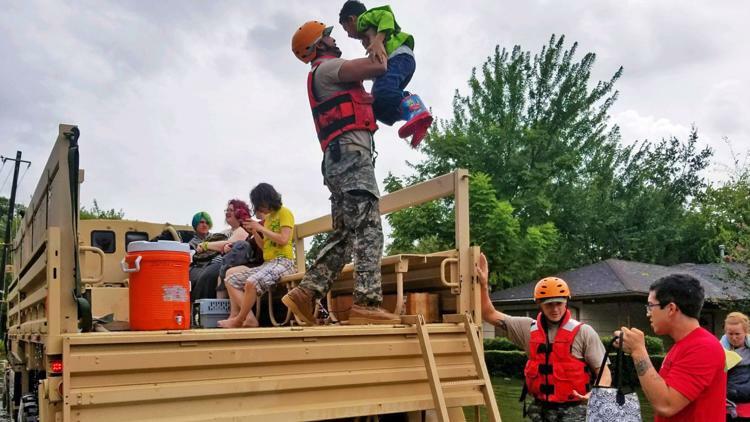 In this handout provided by the Army National Guard, A Texas National Guardsman carries a resident from her flooded home following Hurricane Harvey August 27, 2017 in Houston, Texas. 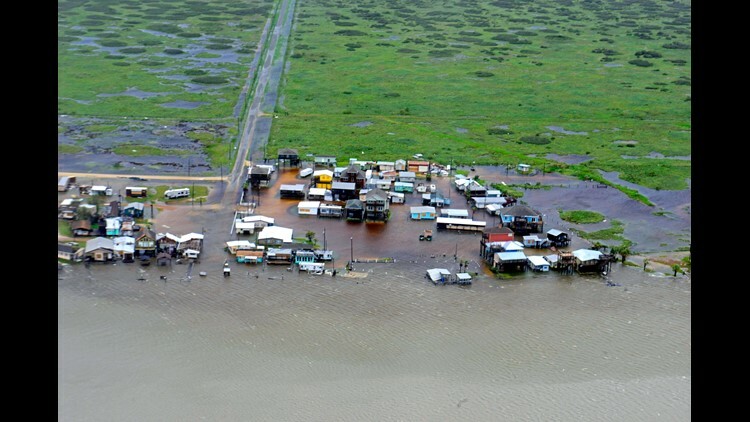 In this handout provided by the U.S. Coast Guard, The Coast Guard assessed damage and offered search and rescue assisitance during an overflight from Port Aransas to Port O&#39;Connor, Texas, August 26, 2017. 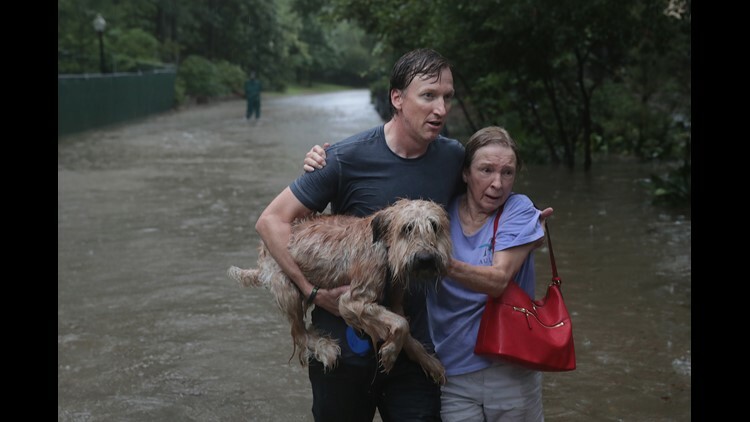 Andrew White (L) helps a neighbor down a street after rescuing her from her home in his boat during Tropical Storm Harvey on August 27, 2017 in Houston, Texas. 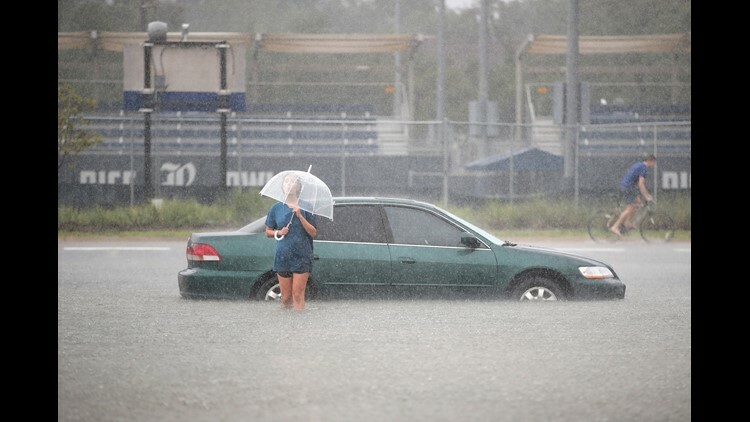 Mari Zertuche walks through a flooded parking lot on the campus of Rice University afer it was inundated with water from Hurricane Harvey on August 27, 2017 in Houston, Texas. 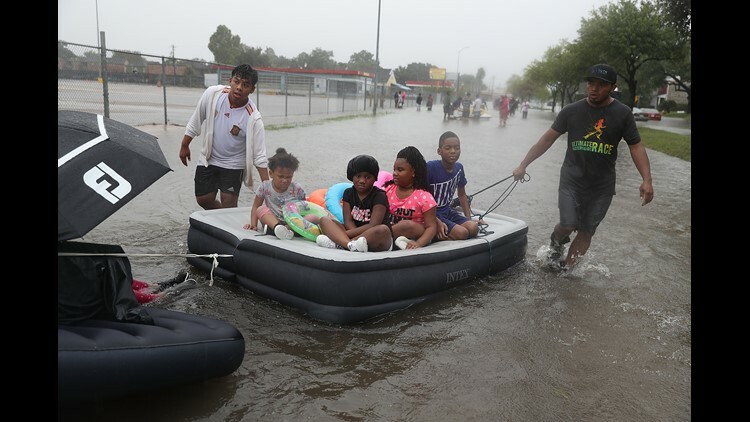 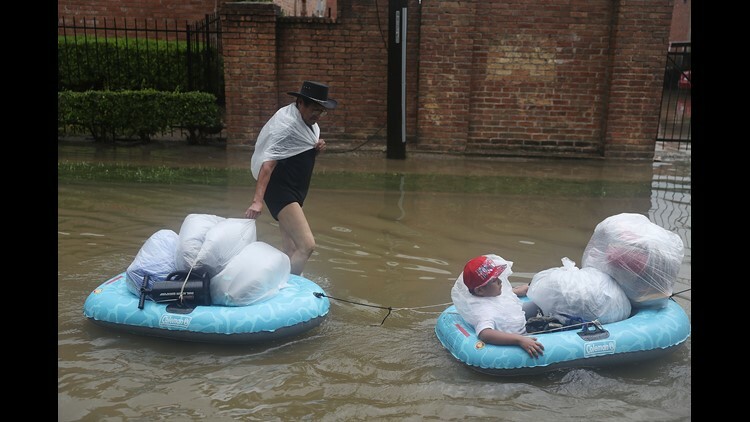 People use an air matress to float down a flooded street as they evacuate their homes after the area was inundated with flooding from Hurricane Harvey on August 27, 2017 in Houston, Texas. 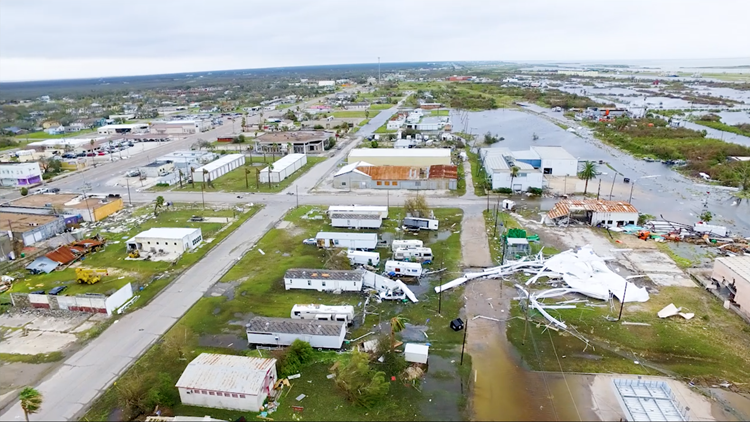 KIII 3 News drone footage of the incredible damage seen Sunday, Aug. 27, in Aransas Pass, Texas, after Hurricane Harvey came ashore. 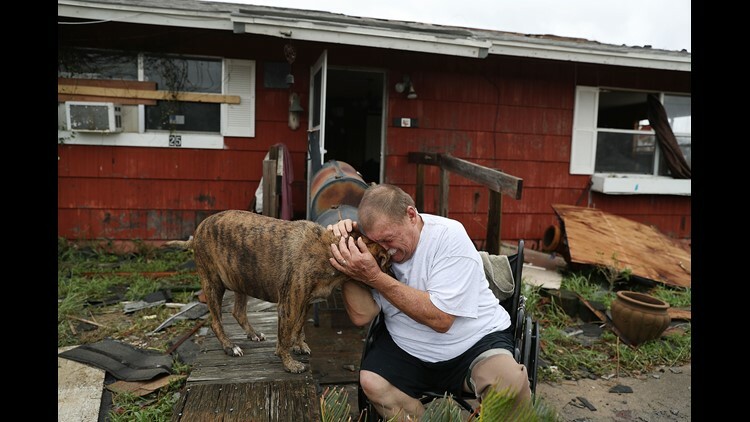 Steve Culver cries with his dog Otis as he talks about what he said was the, &amp;quot;most terrifying event in his life,&amp;quot; when Hurricane Harvey blew in and destroyed most of his home while he and his wife took shelter there in Rockport, Texas. 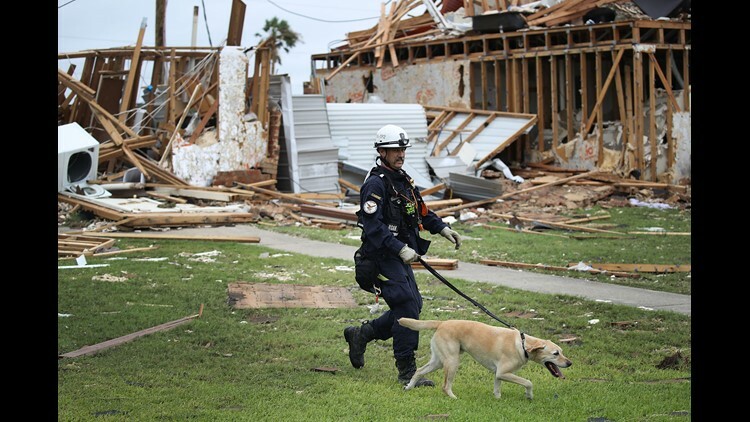 Robert Grant and Rocky from the Texas Task Force 2 search and rescue team work through a destroyed apartment complex trying to find anyone that still may be in the apartment complex after Hurricane Harvey passed through Rockport, Texas. 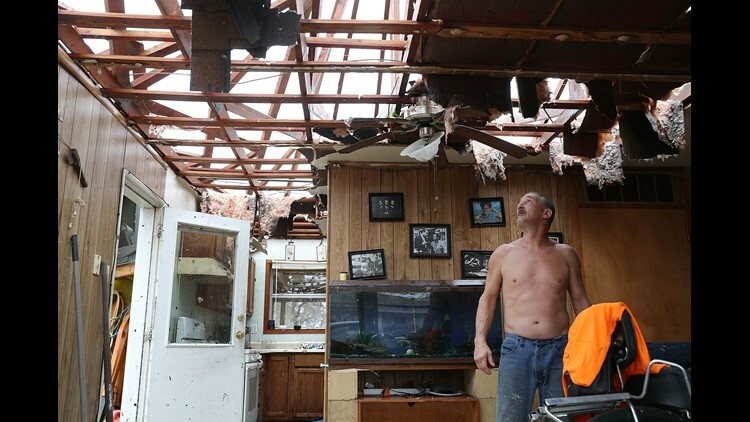 Aaron Tobias who said he lost everything stands in what is left of his home after Hurricane Harvey blew in and destroyed most of the house on August 26, 2017 in Rockport, Texas. 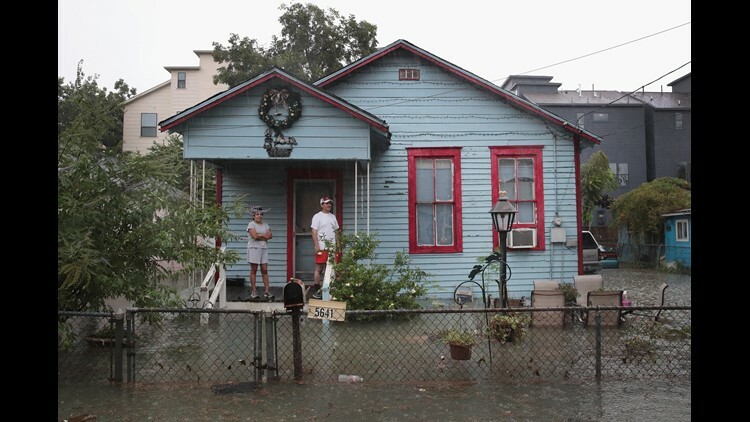 People on a porch watch as rain from Hurricane Harvey inundates the Cottage Grove neighborhood on August 27, 2017 in Houston, Texas. 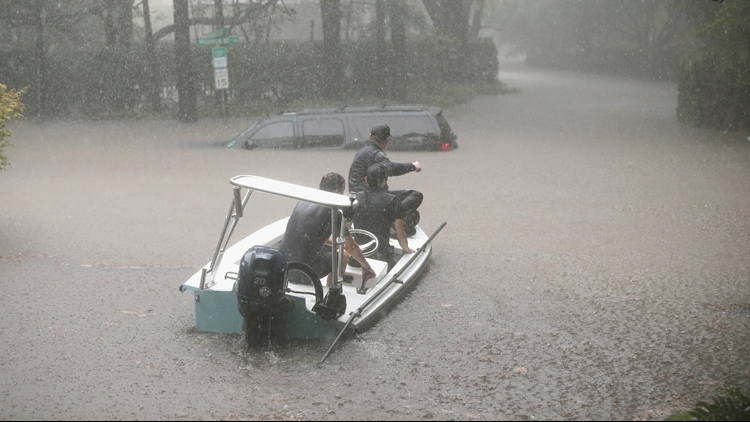 Residents navigate a flooded street that has been inundated with water from Hurricane Harvey on August 27, 2017 in Houston, Texas. 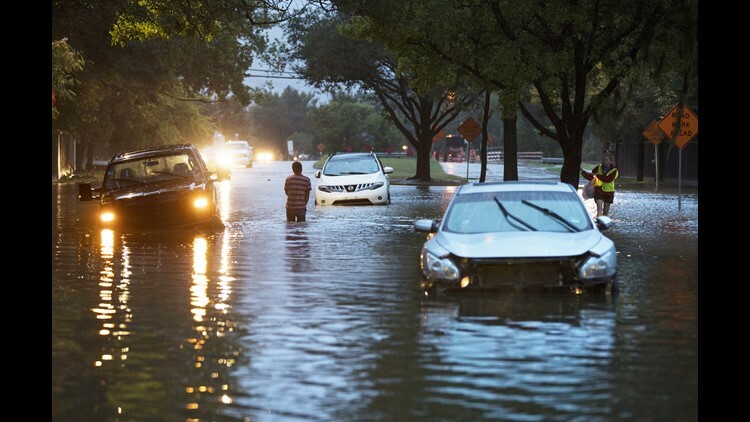 Stranded vehicles sit where they got stuck in high water from Hurricane Harvey on Dairy Ashford Drive, August 28, 2017 in Houston, Texas. 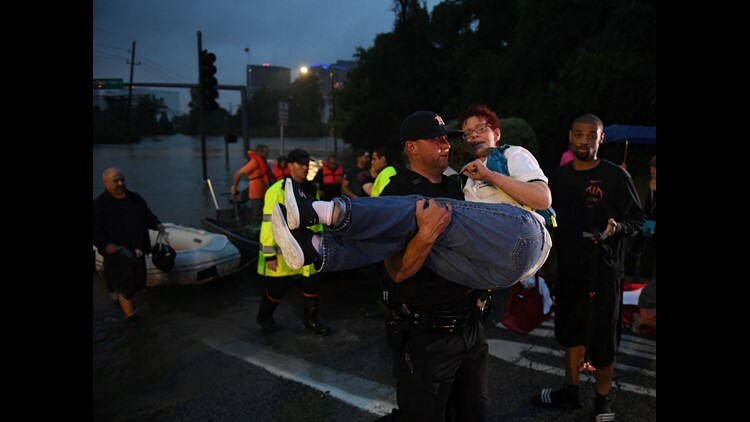 A woman is carried after being rescued from a hotel by boat due to heavy flooding by Hurricane Harvey in Houston, Texas on August 27, 2017. 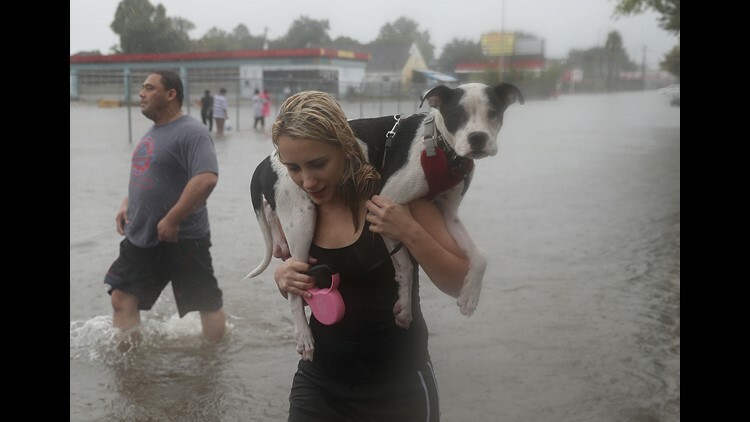 Naomi Coto carries Simba on her shoulders as they evacuate their home after the area was inundated with flooding from Hurricane Harvey on August 27, 2017 in Houston, Texas. 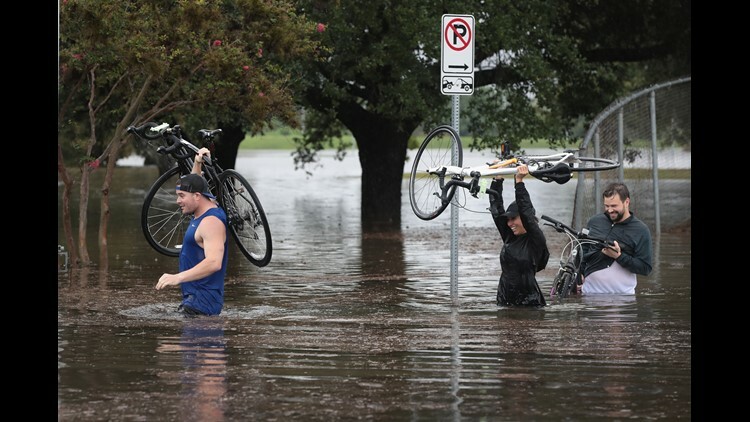 People walk down a flooded street as they evacuate their homes after the area was inundated with flooding from Hurricane Harvey on August 27, 2017 in Houston, Texas. 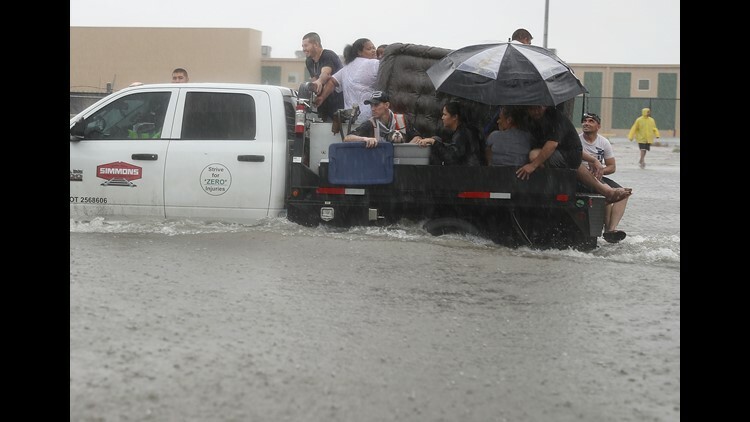 People use a truck to evacuate their homes after the area was inundated with flooding from Hurricane Harvey on August 27, 2017 in Houston, Texas.